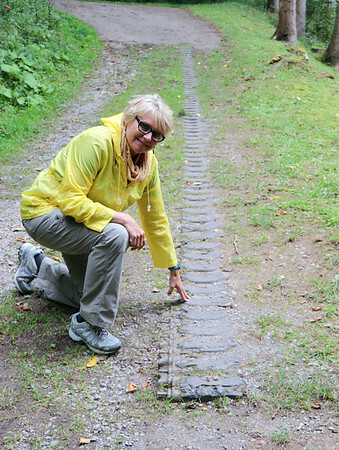 Kristen Snoddy down beside an imbedded tank track in the Hurtgen Forest, which had broken down and had to be eventually pushed down the hill so that more tanks could make their way though the narrow road. The Hurtgen Forest is where our father lived in "tents" made of wood and tin during the cold winter of 1945. They suspended cans containing stones on wire surrounding their perimeter so that they would be alerted of approaching Germans during the night.